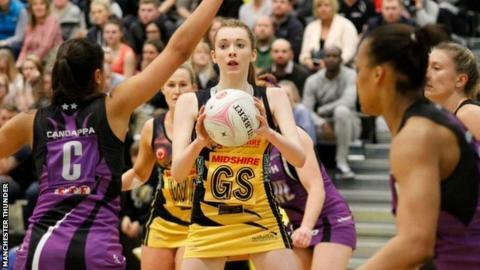 Manchester Thunder coach Tracey Neville hopes the Superleague can one day emulate the "stardom" of football. Reigning champions Thunder will host Hertfordshire Mavericks in the play-off semi-finals on Saturday in front of a club record 4,000-strong crowd. And Neville, the sister of ex-Manchester United duo Phil and Gary, wants the sport to continue to grow. "We need to migrate that stardom image associated with other sports," said the 38-year-old interim England coach. "When I think about me, Gary and Phil growing up, we had our football idols, we had their kits, their boots, we wanted to eat what they were eating. We need to create that ethos around netball." The English domestic league is now in its 10th year and is made up of eight semi-professional franchises from across the country. The biggest attendance record was set earlier in the season by the league's showpiece event at the Copper Box Arena in London between Surrey Storm and the Mavericks, which was watched by 6,000 spectators. "We have some franchises moving towards becoming professional but it's not a collective movement," continued Neville, who will take up her new role with England next month. "If you think 10 years ago my coach was on the bench watching me play, we have moved the game on quickly from that, but we are five years away from achieving what we would like to." Two-time champions Manchester finished unbeaten at the top of the table at the end of the regular season, three places ahead of Hertfordshire. The winner of their game will face either Surrey Storm and Yorkshire Jets, who contest the first semi-final on Saturday. Is football failing black managers?